they have already won their supporters and die-hard enemies. The brand itself is constantly developing and improving communication with the client. The confirmation of this state of affairs are further quality certificates (RoHS, CE, Rzetelna Firma) and from the clients' side the award of Vordon Business Gazelle for 2016. 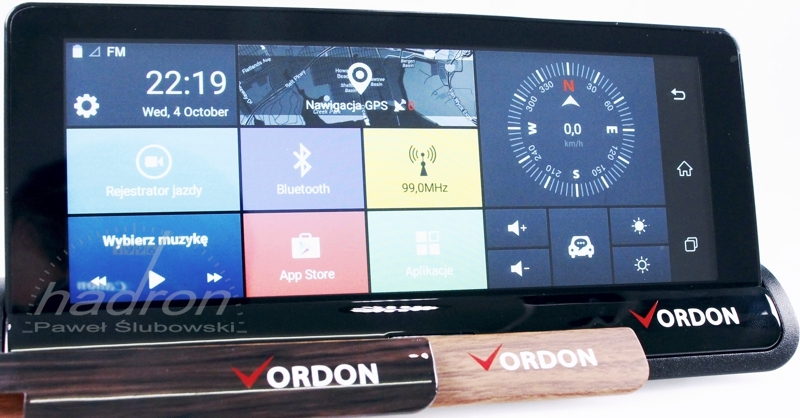 The recorder mCar under the sign of Vordon is another multimedia device that contains much more than is indicated by trade name of the device. If you want to enjoy the latest solutions in the field of car multimedia, but you do not want to disassemble the factory equipment, the mCar station has been created for you. No alterations in the cockpit; connect the plug in the cigarette lighter socket, put the mCar station within reach and you can already command a lot of devices. The banality of "assembly" makes the interior line is preserved, but the possibility of controlling the devices with the touch of a finger is dramatically increased. The Vordon designers also took care of details. In the set there are as many as three panels adorning the front of the device (pure black, brown wood, dark wood) enabling the device to fit into any interior. IPS (7 ") touch screen multimedia station allows you to operate the device and play audio and video files at the touch of a finger. So you can enjoy high quality movies, music or games on the go, during stops or standing in traffic. The front, digital camera has been cleverly built into the back of the housing. Mounting on the ball mount ensures adjustment of the up-down and left-right framing. The rear analog camera has a dual function. It is used to record the image behind the car as well as provides a perfect view during the reversing maneuver. The connection is wired, but thanks to analog standards you can use universal wireless modules, which you will find in our offer , and which will allow wireless transmission of video from the camera to the mCar Vordon station. The G sensor (G-Sensor) initiates recording of 10-second video files when a shock is detected. You can set the sensor sensitivity G (high, normal, low); Normally, normal sensitivity is the best choice. G-Sensor can be useful when you have to recreate a parking event that happened in your absence and identify, for example, the driver of the car scratch. The parking monitoring function also takes care of your car. After it is turned on (when the recorder is in sleep mode), the systems work is resumed and they start to record 30-second video clips. The automatic parking mode, on the other hand, will cause the image to switch to the rear camera with the parking line preview (the preview of the rear camera will be automatically turned off and return to the previous mode when the parking signal disappears). recorder operating on Android is also equipped with a GPS module. The default map for GPS navigation is Google Maps. Of course, you can set a different GPS map from the list (Navitel, Waze). In this way, you will find the best routes, avoid traffic jams and you will not get lost when driving through an unknown city. If we add that the mCar device can be equipped with a radar and patrol warning system, i.e. 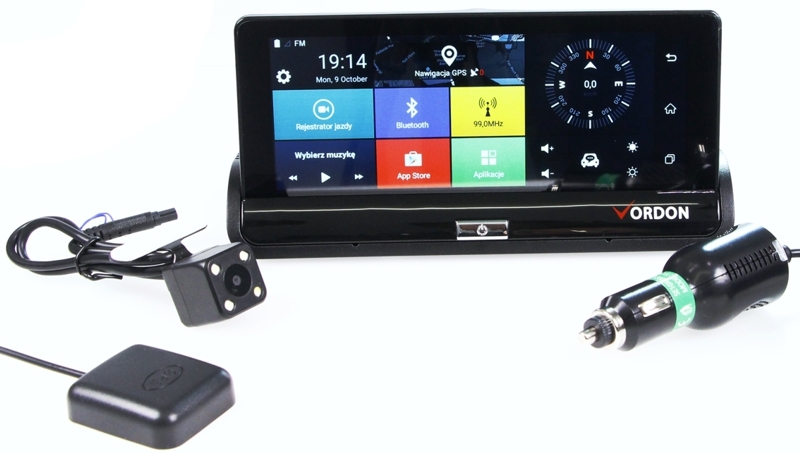 a popular Yanosik , we obtain a comprehensive driver assistance system. All you need to do is click the Bluetooth shortcut on your device and go to the cordless menu of the handset. Then you'll open the Bluetooth settings on your smartphone and find the car registrar on it. You can pair your devices in this way and the list of your telephone contacts will be automatically synchronized with the mCar recorder. The device can handle any number of phones, but communication is done via Bluetooth, so you have to choose the device with which you want to communicate at any given time. The only disadvantage of the Vordon mCar DVR device is that it is so good that it can become an easy prey for thieves.